Owner resources for Chris Heintz Designs. Go to the Zenithair.com Builder Resource Area. http://www.zenithair.net/Builder-Secure/ Register your aircraft with Zenith Aircraft Co., get a password and log on for all the updates. Zenair Ltd does not have an up-to-date complete list of owners as many owners (especially second owners) do not register with Zenair. Updates are posted but its your responsibility as an aircraft owner to make sure your aircraft is up-to-date. For definitive instructions regarding all elements from the basic airframe, always refer to the original aircraft drawings! Please note that Zenair has only ever offered drawings and airframe kits for Chris Heintz designs. Ready-to-fly aircraft built from these "drawings and kits" and sold in Europe have often been slightly modified by the assembler to meet customer requests, regional needs and/or local regulations. WARNING: Zenair and/or Chris Heintz cannot be responsible for deviations from their standard designs made by various independent builders. To know if a specific aircraft truly conforms to Zenair specifications, it will need to be carefully compared to original Zenair reference drawings. Following is NOT a complete list. Register and go to http://www.zenithair.net/Builder-Secure/ for all the latest updates. This pre-first-flight inspection list was developed by AMD in the USA. It's use is mandatory for the inspection process of the factory-assembled S-LSA version of the CH 601 XL and CH 650. Zenair strongly recommends that this list also be used by owners of Experimental and/or ULM versions of these aircraft, prior to first flight, for annual inspections and/or after major overhauls or repairs. Note: European (ultralight) versions of the Zodiac differ slightly from their US counterparts. This list will therefore need to be adapted by the user, especially as it relates to installed engine and landing gear system. ULM Technologie is now the European importer of original Zenair parts for all Zenair models. You can order any part by phone or on-line. Please call or write for a quote. 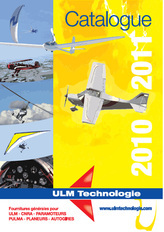 For a paper copy of the full-color ULM-Technologie catalog (contains thousands of parts, tools, instruments, accessories, etc.) contact ULM at +33.03.27.33.20.20. The virtual catalog is available online free HERE.